Now that you can mix your basic colors, lets mix those up even more! It is a rare moment where you will paint with a straight, flat color. 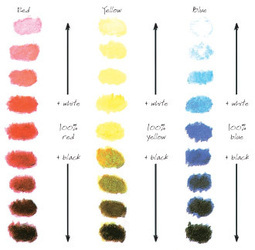 Most times, in order to achieve dimension and depth to your work, you need subtle variations of the same color in order to depict highlights, shadows or just straight up, plain visual interest! There are a couple of ways to change a color and a couple of reasons why you would choose one technique over the other (of which we will discuss and experience in class). This brings us back to our common vocabulary. * sometimes you want to change the VALUE of a color. This is done by adding either white (to create a tint) or black (to create a shade).